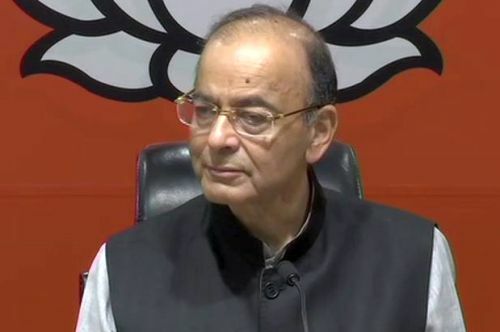 Union Finance Minister Arun Jaitley today slammed Congress president Rahul Gandhi for promising India’s poor a “historic” minimum income guarantee scheme, saying that a party with such a terrible track record of poverty alleviation has no right to make such assurances. Jaitley claimed that the Congress has a history of making false promises. “They had promised a farm loan waiver of Rs 72,000 in 2008, but gave away only Rs 52,000. A Comptroller and Auditor General later found that Delhi businessmen ended up getting most of the money,” he said. Gandhi had earlier today announced a minimum income guarantee scheme of Rs. 72,000 a year for India’s poorest families if the Congress came to power. He said that the money, which would be directly transferred to the bank accounts of 20% of the poorest in the country, would lift five crore families out of poverty. The Union finance minister, in his statement, claimed that the Narendra Modi government was already giving 1.5 times the amount promised by Gandhi to the country’s poor. “We are already give Rs. 75,000-crore fertiliser subsidy and spending Rs. 20,000 crore on health. We are already giving 70-80 per cent through direct bank transfer, and the rest can be given the same way,” he explained. Congress president Rahul Gandhi has promised to give Rs 72,000 per annum to 20% of India’s most poor families under the minimum basic income guarantee scheme if the Congress comes to power after the 2019 Lok Sabha elections. The scheme will benefit 5 crore families and 25 crore individuals directly. “After doing all the calculations several times, we have found that this scheme is fiscally possible,” Gandhi said while addressing a press conference today. “There is no such scheme anywhere else in the world. We will eradicate poverty. This is the finaly assault on poverty,” Rahul said at a press conference, for once, steering clear from the Rafale controversy.